In their current form, shipping containers have been around since the 1950s but have only become a construction material in the past decade to construct the popular shipping container home. Insulation: rigid phenolic foam 100mm in floor, 150mm in walls; flat roof waterproof system with 150mm polyurethane foam. Windows: Sliding timber / aluminium-clad glazed screen measuring over 9 meters long. 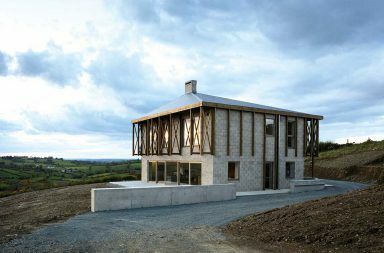 This global housing and architectural trend spread to Ireland in the form of small or student projects, none of which are believed to have been built to be fully compliant to building regulations. 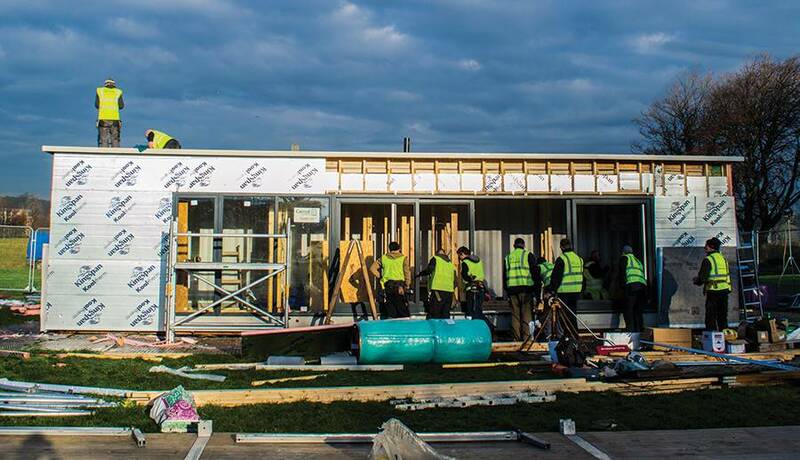 Project RIPPLE, meanwhile, happened in November 2014 bringing together 65 professional and trades people, suppliers and supporters to create what’s believed to be the very first, fully-compliant, home in ROI, made entirely from a disused shipping container. Here’s the story of the conversion of scrap into a home as told by Carol Tallon. People are choosing to live in a different way. Simply put, innovation within the property market in Ireland has not kept pace with changing global trends; for example, people are moving away from the notions of permanency or lifetime debt. In a more mobile society, there is a need for flexible approaches to home ownership. A low cost model of sustainable housing was inevitable after the property market crash; building with shipping containers is simply one potential solution in a country that has sufficient space to accommodate different lifestyle choices. While the initial aim of project RIPPLE was to come up with a low-cost model of housing that could be rolled out quickly and without the long lead-in time that traditional housing requires, it became clear that this approach contained its own unique challenges in Ireland. Our climate demands greater levels of insulation, and given the size of the container, it had to be external rather than internal. The project took two years to plan and during that time the general property market in Ireland recovered at a pace much quicker than expected. Thus many sites and opportunities disappeared. While difficult for the project, rising housing prices reinforced the need for a low cost model for housing, particularly in the capital. Perhaps the greatest challenge was the introduction of new, more onerous building regulations in early 2014, which meant increased compliance issues and with those, increased costs for all self-builders. 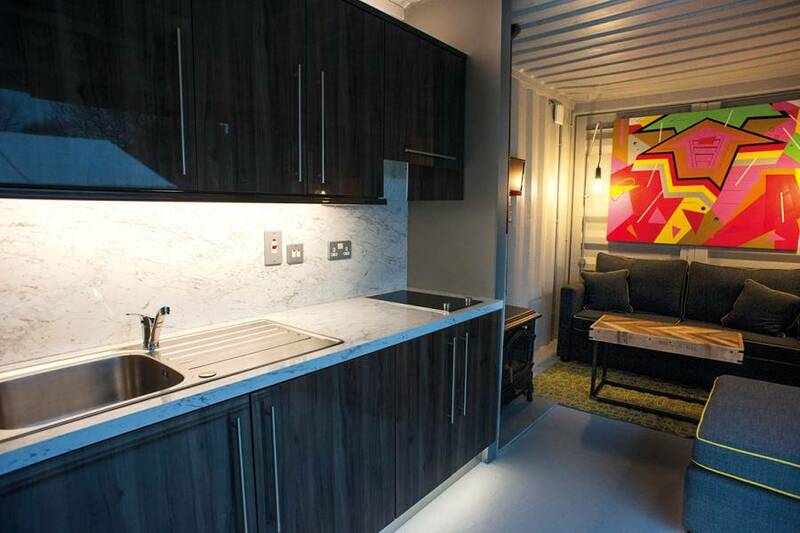 The same home traditionally built would cost €55,000 but a 40ft shipping container can be converted into a fully-compliant home from €25,000 direct labour or €35,000 using a contractor. Accommodation consists of an entrance into the kitchen, with lounge/seated area to the right and storage cupboard to the left. A hallway leads to a fully-accessible bathroom, with WC and shower, then into the deceptively spacious bedroom with extended height, double bunk beds and built-in wardrobe. The timeline below is for this particular project which had some aspects and challenges unique to it, such as it only taking three days to build. More importantly, it was an entirely voluntary and charitable project. All labour and materials were donated or sponsored; we therefore had to work with what we were given, using the labour available within a very short time frame. The temporary site required preparatory steelworks which were done offsite. Markings were made using a chalk line then permanent marker on the interior of the container for window and door openings, chimney exit and roof pipes for solar panels. This was done by recreating the floor plan inside. The next step was to put in acrows (steel bars used for temporary support from floor to ceiling with threads for adjustable heights,) before cutting out the side of the container. But before we could do that, the side panel had to be removed to reveal the steel cross members to allow us to cut out the side of the container along the markings using an angle-grinder. Steel supports around the openings were made by the team to give new strength to the structure. These were connected to the steel cross-members of the floor. On the roof of the container, the four lifting points were extended to allow for a super-insulated fibreglass roof whilst still allowing for the container to be transported. In the grounds of the Irish Museum of Modern Art (IMMA) in Kilmainham, Dublin with a team of 20 to 30 people on site, a rusted and slightly battered 40 ft container was craned off the delivery lorry and placed on a firm, level site of concrete and gravel. 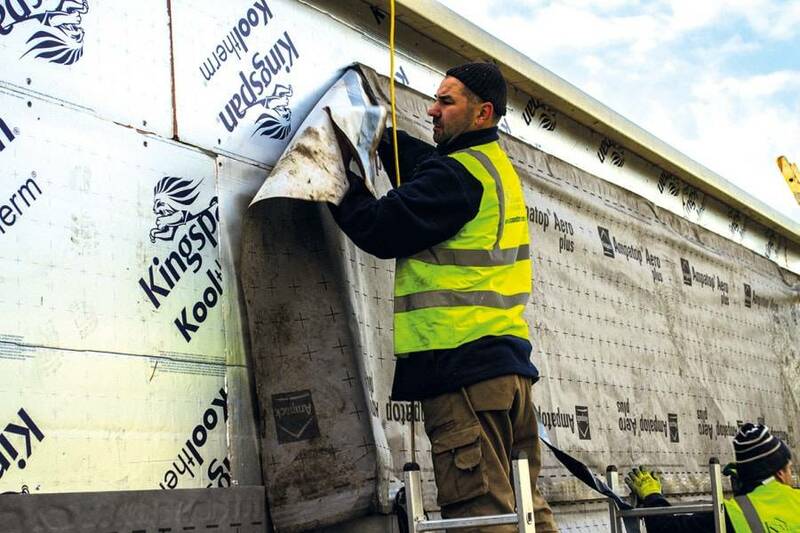 As we were aiming for passiv or near passiv haus standards the entire container was wrapped in an airtight membrane then the exterior timber frame was built around it, using 4×2” timbers. The insulation was cut to size and placed between each of the battens with a second layer screwed on the outside of the timber frame in larger panels. The entire building was wrapped again in another watertight membrane. Inside, a sheet of membrane was sealed to the floor and two layers of insulation placed on top. Marine plywood was then screwed into place to create the upper surface of the floor. We had decided to leave the rippled interior exposed with the walls and ceilings spray painted in a light grey colour. The idea came from commercial projects but it works well for houses too. The plumber and electrician worked together on the roof mounted hot water solar panels (evacuated tubes). The exterior was sealed using glass reinforced polyester (GRP) and a roof created from fibreglass. This section was completed by putting the downpipes in place. Next to go in were the windows and exterior doors which were tinted for aesthetic reasons and to aid the energy performance of the glass. 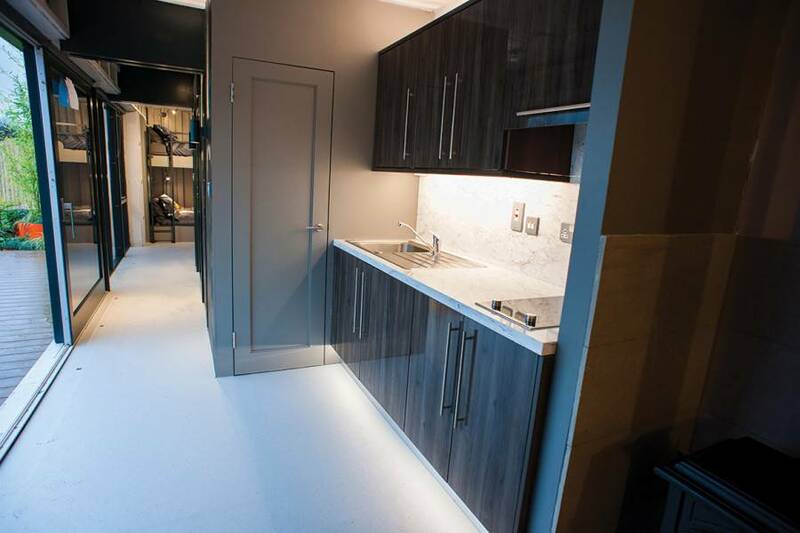 All the electricals and plumbing were completed and connected and the joinery, bespoke double bunk beds, storage spaces and the kitchen were installed; all coordinated by an interior designer. With watertight, breather membranes completed and battening prepared, the external cladding began. While the original RIPPLE design provided for a more traditional timber cladding, a design choice was made to experiment with bamboo, to truly stunning effect, especially after adding exterior uplights and downlights. A quality, composite decking area was fitted, creating raised access into the building whilst some final landscaping completed the project and the site was opened for viewing. On day four of the project, Sunday 30th November 2014, this stunning new home was donated to the Society of St. Vincent de Paul to support their work in helping the homeless. The plan is for it to be located at the charity’s women and children shelter in Longford, Bethany House, subject to site suitability and local planning approval. Hopefully the container house will be used as an alternative to unsatisfactory hotel or B&B rooms for families, while they are waiting for more permanent accommodation. 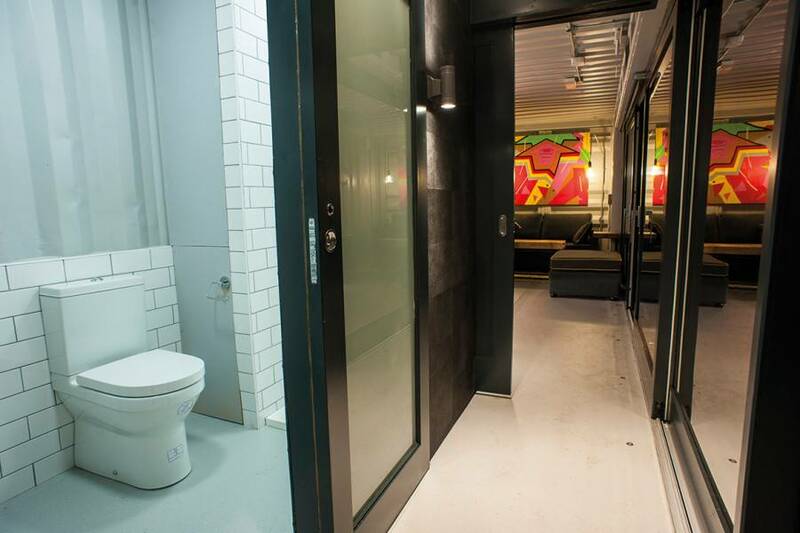 The use of converted shipping containers to provide emergency accommodation is in use worldwide, Australia started using these dwellings in 2007. This has to be good news following a year of reports about the rise in homelessness in Ireland and the doubling of the number of families in emergency accommodation since last year. This project will take one family off that list and whilst one is not a big number, not only is it a start, one family has a whole new quality of life and that has to be worth a lot. Since embarking on this unusual build, many similar projects at various stages of planning and preparation have come to light. To date, planning permission has been granted for at least two container builds in Dublin and County Cork, with many more expected throughout 2015 and 2016. 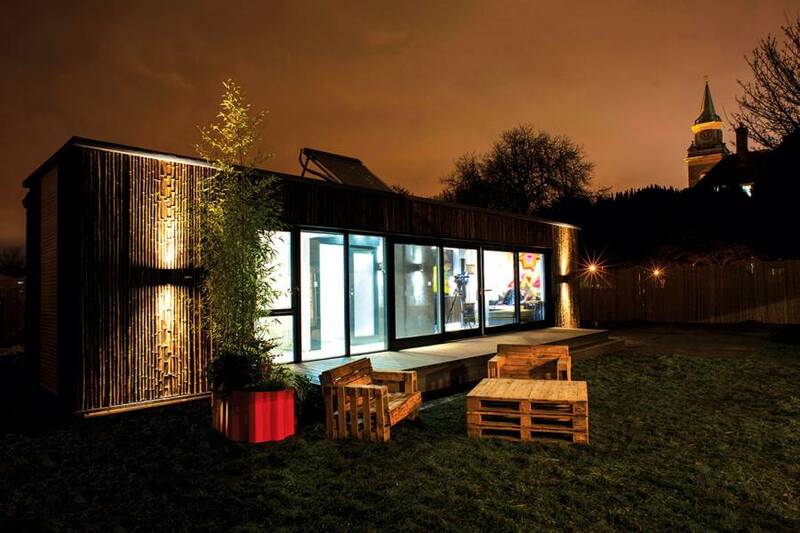 Containers make an ideal structure for self-builders due to their ridged frame, manageable size and versatility. So what are you waiting for? do you have a price for one of this conversions? 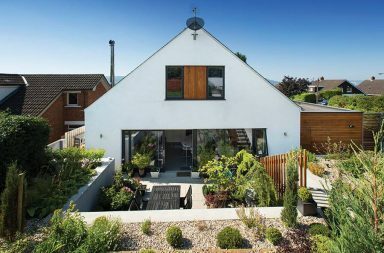 The same home traditionally built would cost €55,000 but a 40ft shipping container can be converted into a fully-compliant home from €25,000 direct labour or €35,000 using a contractor. The author of the article Carol Tallon tells us that as a general rule, it’s best to assume that planning is required. 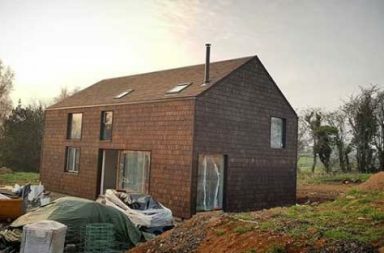 This is always true where you need to connect to mains services and will likely be true for off-grid homes although she points out that guidelines for shipping container homes have yet to be established as they remain at an experimental stage in Ireland. As with all builds the foundations will depend upon the site and build specification, so will have to be designed accordingly by an engineer. Is it difficult to get planning in ROI? what sort of cost for planning and electrics and plumbing for a basic 2 bed? Oh I was thinking of county Galway when asking about planning permission! Hi Emma In terms of planning permission make sure you consult both the rural building guidelines and the development plan that relate to your specific area (check your local authority's website or ring the planning office to get hard copies). This will give you a fair indication of what the planners are looking for. As you'll find out, some areas are nearly impossible to get planning permission in (protected areas such as those of outstanding natural beauty), but others should be relatively straightforward. Once you feel your plans match up to the local authority guidelines and requirements, do organise a pre planning meeting to discuss them with the planners directly. Each case is truly unique and needs to be approved individually so it's a good idea to get their feedback early on, before you get formal plans drawn up by a design professional. In terms of cost it's very difficult to give an estimate on any aspect as it will depend on the complexity of the plans, where you are and which tradesman you get to do the job. If you're clear on what you need exactly you could get a few quotations but make sure you ask qualified tradesmen to supply them. The best course of action is to get your detailed plans costed by a quantity surveyor (they’re trained to do this and are independent). Hope this helps and do keep us posted on progress if you get a chance. All the best and welcome to to wonderful world of building your own home! 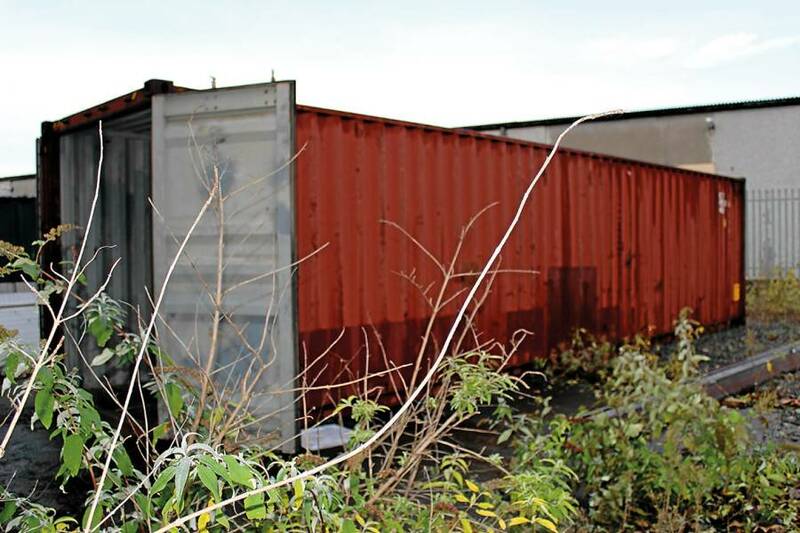 Was wondering if there was any updates on the info / requirements regarding container home's. Also live in Co Galway. Hi guys, a bit of good news, I sent a message in Cavan county council regarding shipping containers house built and they said that this type of design have been approved by council.. this is their actual message. Hi Vhon. I've consulted with our Planning Department, and they've informed me that this type of house has been permitted in Cavan previously. However, this is totally dependent on the site and environment in which it is proposed. If you were proposing to build a house like this here, you should arrange to meet with the area planner in a pre-planning meeting. which will have to be adhered to in the planner's assessment of the application. did anyone in ireland get planning recently? 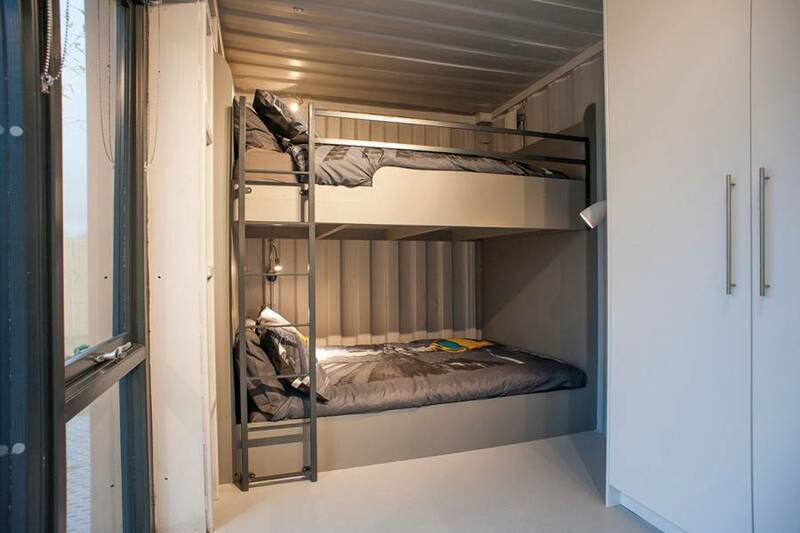 Any idea how much it would be to build a two bed shipping container?? I know I'd probably need 2 container for this..
Hi. Just found your site. Do you need planning permission if you have a field and want to live completely off grid. Are there regulations in regards to the size of the homeyou can build.